The dry rhizome and root of perennial herbaceous plant Notopterygium incisum Ting. ex H. T. Chang or N. forbesii Boiss. of family Umbelli ferae. Notopterygium incisum Ting. ex H. T. Chang primarily grows in Sichuan, Yunnan, Qinghai provinces in China; N. forbesii Boiss. primarily grows in Sichuan, Qinghai, Shanxi,Henan provinces in China. Fragrant smell, slightly bitter and pungent taste. Big strip with dark brown skin, many red spots on the cross section and strong fragrance. Pungent, bitter, warm; lung and bladder meridians entered. Release exterior and disperse cold, expel wind-damp and alleviate pain. This herb has strong actions of releasing exterior and dispersing cold, expelling wind-damp as well as alleviating pain. It is indicated for the cases with more severe syndrome of external wind-cold contraction with concurrent dampness, which is manifested as aversion to cold and fever, absence of sweat, headache, painful and stiff nape, aching pain of body and limbs. It is usually conbined with herbs that release wind-cold and expel dampness and alleviate pain. For instance it is combined with Fang Feng, Chuan Xiong in Jiu Wei Qiang Huo Tang from Ci Shi Nan Zhi (Such Inscrutable Matter). It is combined with Du Huo, Gao Ben, Fang Feng in Qiang Huo Sheng Shi Tang from Nei Wai Shang Bian Huo Lun (Treatise on Confuse Differentiation of Internal and External Injury). Being pungent and warm with the strong actions of expelling wind-damp and alleviating pain, it is also used for wind-cold-damp arthralgia manifested as body and limbs pain. Because it enters taiyang bladder meridian of foot and is good at alleviating headache and pain of shoulder and back, it especially is suitable for treating wind-cold arthralgia and body and limbs pain in upper half-length. It is usually combined with wind-damp-expelling herbs and blood-activating and pain-alleviating herbs. For instance it is combined with Fang Feng, Dang Gui in Juan Bi Tang from Bai Yi Xuan Fang (Precisely-selected Prescriptions). For headache due to invasion of wind-cold or wind-damp pathogens, it is usually combined with wind-expelling and pain-alleviating herbs, such as Chuan Xiong, Bai Zhi and Gao Ben. It should be used with cautions for blood deficiency because of its strong pungent, fragrant, warm and dry property. 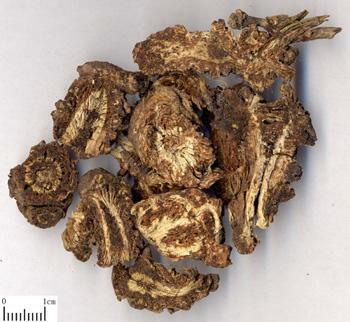 It is not appropriate for weakness of spleen and stomach because large dose of this herb induces vomiting.